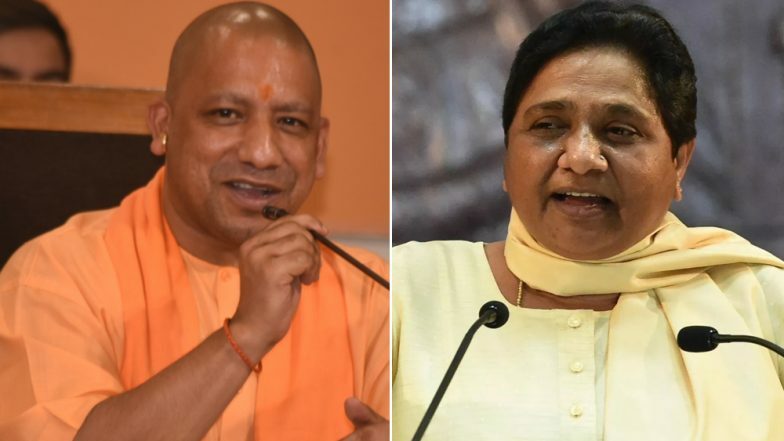 Lucknow, March 21: Bahujan Samaj Party (BJP) chief Mayawati on Thursday countered Uttar Pradesh Chief Minister Yogi Adityanath's claim that the state did not witness any riots in the last two years, calling it a "farce". In a series of tweets, Mayawati wished citizens on the festival and Holi and also took on Yogi Adityanath led Bharatiya Janata Party (BJP) government in Uttar Pradesh for its claim that no communal riot took place in last two years. "BJP's claim that UP remain riot-free in past 2 years is farce. During the period BJP leaders & ministers remain awfully busy in lifting of heinous cases against them. And what about mob lynching etc which brought bad name to the country and ultimately Hon court had to intervene (sic)," Mayawati tweeted. Yogi Adityanath, who completed two years in office on Tuesday, claimed not a single riot had taken place in the state since March 2017. Mayawati Says She Won't Contest 2019 Lok Sabha Election. BJP's claim that UP remain riot-free in past 2 years is farce. During the period BJP leaders & ministers remain awfully busy in lifting of heinous cases against them. And what about mob lynching etc which brought bad name to the country and ultimately Hon court had to intervene. "After 1990, there had been governments of BSP and SP. During this period, the state witnessed a new level of anarchy and violence. There were rapes, murder, looting and corruption (earlier). This gave an identity crisis to youths and forced farmers to commit suicide. The state witnessed hundreds of communal riots during the last regime of Samajwadi Party. But in the last two years, there has been no communal incident," Adityanath said on Wednesday. The chief minister also blamed the Congress for turning Uttar Pradesh into a BIMARU state. BIMARU as an acronym stood for Bihar, Madhya Pradesh, Rajasthan and Uttar Pradesh, which were once considered the most backward states economically. His allegations were countered by Congress General Secretary Priyanka Gandhi Vadra who said his report card reads well but nothing has really been achieved. BJP Will Be Brought Down to 5 Seats in UP If BSP-SP Alliance Joins Hands With Congress, Says Mood Of The Nation Survey. "I have been meeting every section of society, including farmers and Anganwadi workers. All are in distress. They have got nothing, There is a difference between the reality and what they speak. Yogi's report card promotion sounds good but there is nothing on ground," she said. While Yogi Adityanath claims there has been no communal incident in Uttar Pradesh in last two years, Union Home Minister Rajanth Singh told Parliament on March 13, 2018, that the rise in communal violence was the highest in Uttar Pradesh - 822 incidents and 111 people killed in 2017 itself - the highest in four years.